Having lived a number of years in Central Europe, I developed an acquired taste for coffee houses. Long gloomy winters make them the ideal place to spend a nice afternoon in Budapest, Prague, Vienna and many other cities. They are the place to meet friends and chat for hours. Coming to Shanghai in 2004, a nice coffee house is what I missed the most. My first coffee place was Starbucks in Xin Tian Di, which was one of the few available then. Other coffee chains had not yet entered the market and there was little alternatives apart from hotels. The opening of Vienna Cafe in late 2004 was just what the doctor ordered. 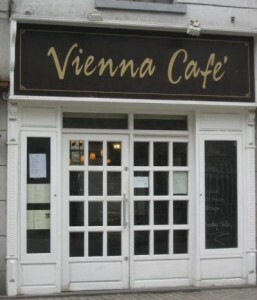 This Viennese coffee house was just like a smaller version of the Budapest coffee houses that I used to go to, making me feel instantly familiar and in love with this place. 5 years later, it is still one of my favorite coffee place in Shanghai. Old Shanghai had numerous cafes and coffee houses. Many of them where located on or near Avenue Joffre (today Huaihai Lu), operated by French or Russian immigrants, often coupled with bakeries. Coffee drinking was brought by foreigners and started to become a symbol of fashion and modernity among Shanghainese. Just like in Europe with Parisian writers meeting and working in cafes, the new groups of Shanghai writers would meet in coffee houses to live the Bohemian live of artists. Cafes were much warmer than the small tinzidians during the arch winters and groups of friends would just make the coffee last long hours to save money. I really became interested in Shanghai coffee houses when I found the document on the left side in an flee market. This is a advertising for the Royal Cafe, that was probably standing on the tables just like in many Shanghai cafes today. 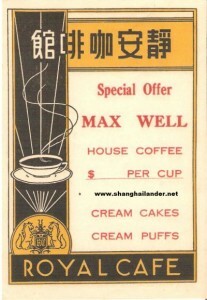 Maxwell Coffee was already very famous in the USA and made it to Shanghai from America. The most interesting is the name of the coffee house in Chinese: Jing An Coffee house. Like there are many modern coffee houses in Shanghai located around JingAn Temple, there must have been a few of them in old Shanghai, probably on Bubbling Well Road (today Nanjing Xi Lu) or the surrounding streets. I have searched for the precise location of the Royal Cafe in old directories, but could not find it. The ad is both in Chinese and in English, so I guess this coffee house was mostly frequented by Chinese people. 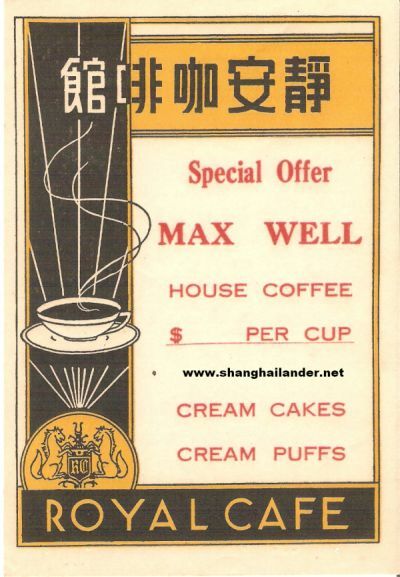 In 1938 Shanghai had 60 foreign cafes listed in the phone book. 9 companies were importing coffee including German trading firm Melchers and 11 companies where selling coffee in retail including Lane Crawford on Nanking Road (today Nanjing Dong Lu). Coffee was imported in large quantity. “The trade of China” 1934 shows that 186,095 Gold Units of Coffee was imported to China in 1933, and 170978 in 1934. Nearly 40% was imported from America and I guess a lot of if was Maxwell coffee that is advertised. About 20% came form “Netherlands India” i.e. today’s Indonesia, being the famous Java Coffee. About 8% from “Straits Settlements” i.e. Malaysia where the tradition of white coffee drinking is still very strong. Just like today, coffee drinking was the symbol of western habits and of modernity. Starbucks and the coffee chains of today found the right location to start operations in Shanghai. No wonder Shanghainese took coffee and coffee house by storm… they already had experienced it in Old Shanghai. This is so fascinating! I am not a coffee drinker, but when I spent time in China a couple decades ago and was so cold during the winters, the only hot drinks I could find were Nescafe instant coffee and green tea. So I became a tea drinker. I’m interested in coffee houses (and tea houses) in Shanghai for the social gathering aspects. Way back when I was a grad student, I wanted to write my thesis about political movements and coffee or tea houses, but I couldn’t find much information so abandoned it. With sites like yours, maybe someone could do dig further into how these cafes created a public space and helped change China after the Qing Dynasty.